It’s summer, so burgers are a must. But I’ve been feeling a bit beef-ed out lately (yes, that’s a term), so this salmon burger definitely appealed to me. The recipe (a Rachael Ray) incorporates the everything bagel (poppy seed, sesame seeds, onion flakes) into the salmon mixture, perfect for all my everything bagel lovers, and the scallion cream cheese topping is a killer. So. Good. 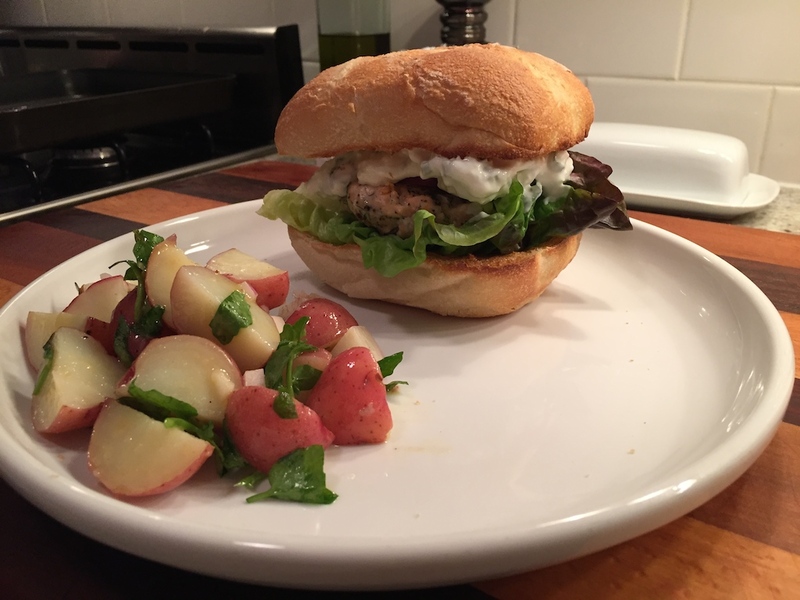 Even better, these cook really fast and are a great, healthy alternative to the regular burger. Make sure the cream cheese is fully softened before mixing the topping — leave it on the counter for at least 30 minutes-1 hour. Otherwise it won’t mix easily. I hear some places actually sell everything bagel seasoning — you could substitute that here for the seeds, etc. Don’t overcook the burgers. I like my salmon medium rare; don’t be afraid to keep it pink in the middle. Serve with a salad or potato salad — I wasn’t a big fan of this one so I’m not sharing the recipe, but this is one of my favorites. Place the salmon in a food processor and pulse to coarse grind the fish.Transfer the fish to a mixing bowl and season with the grill seasoning, poppy and sesame seeds, onion flakes, and dill. Use your hands to mix, then divide into 4 equal portions and form each portion into a patty. Heat a about a tablespoon of olive oil in a large skillet over medium high heat. Cook the burgers for 3 minutes on each side for a pink center, 4-5 minutes on each side for fully cooked. While the burgers cook, combine the cream cheese with the scallions. Fold in the sour cream and lemon juice. Split and lightly toast the rolls. 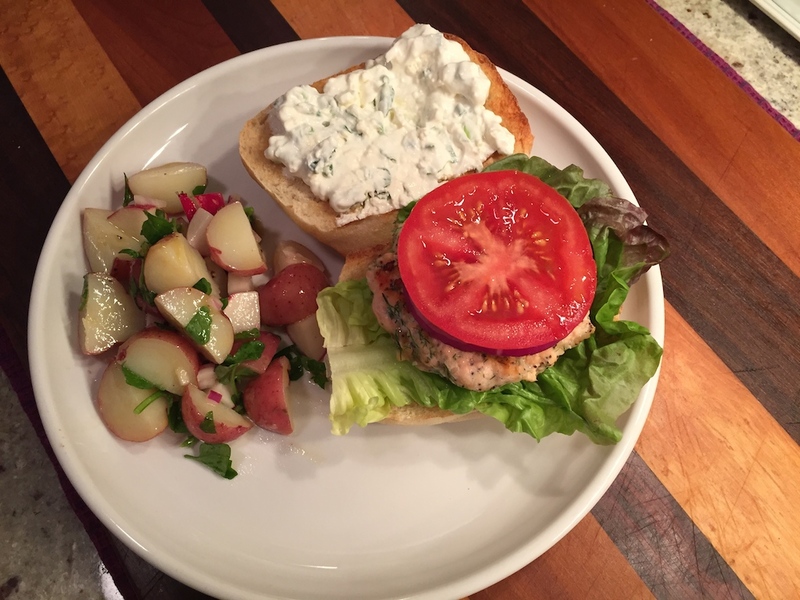 Serve the burgers on the toasted buns topped with lettuce, tomato, red onion, and some of the cream cheese sauce. 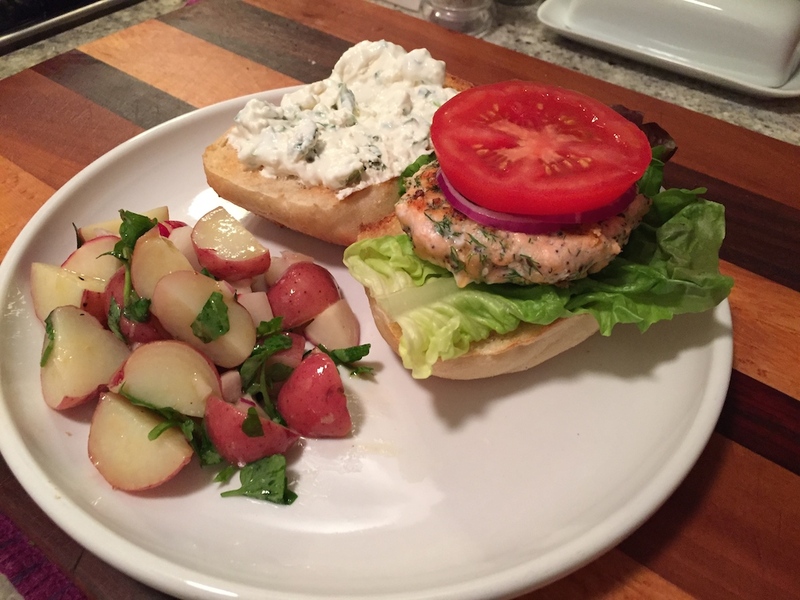 This entry was posted in Recipes and tagged burger, salmon, summer meals by Tricia. Bookmark the permalink.